March | 2014 | ride. travel. live. Los Alamos was secret for many years, especially during the Manhattan Project. Even though the town was opened to the public in 1957, today it remains an isolated community 45 minutes from Santa Fe. But for a town of less than 20,000 people, it’s got a worldwide reputation, mostly for the lab. The lab is off-limits to the public, but the town isn’t. 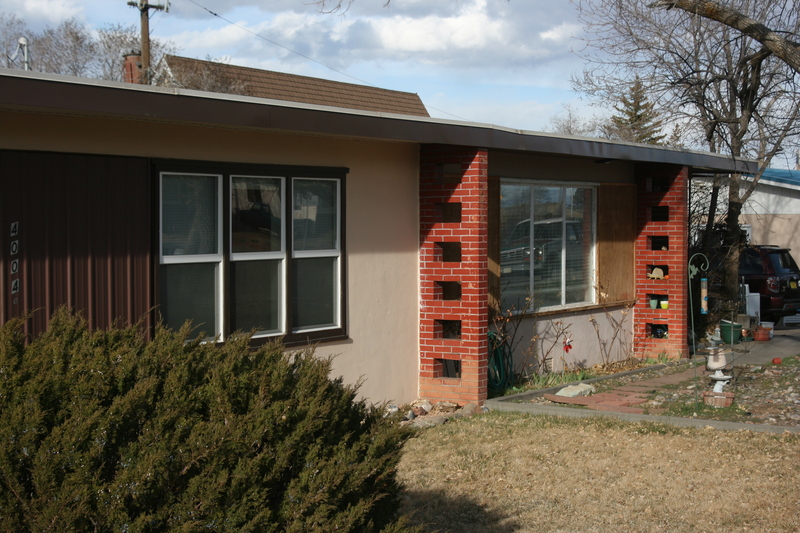 Los Alamos is definitely not known for its buildings, but for the most part, downtown and the early neighborhoods are a time capsule of postwar suburbia. 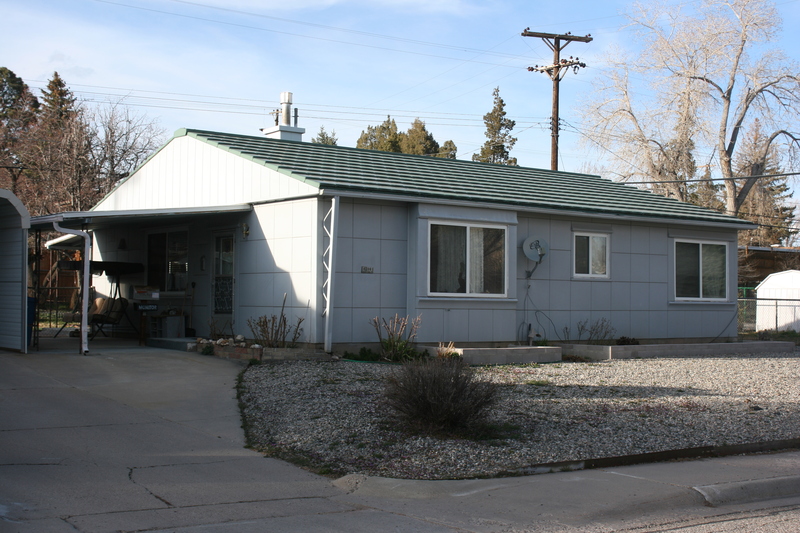 This was the first modern suburb in New Mexico, starting with the housing in the former golf course and pasture that is now known as the Western Area. These structures were built in the late 1940s, to replace the temporary housing during the Manhattan Project, and also to give the area a sense of normalcy (right). It’s hard to tell today, but somehow these slightly ragged houses are the homes of millionaires. Los Alamos is a demographic bubble, one of the richest places in the United States, with one of the highest concentrations of PhDs in the country, and you would never guess it. There are very few chain stores, lots of churches, and few visual signs of prosperity. It’s a company town, whose fortunes go up and down with the government budgets. The surroundings are spectacularly beautiful, rich in archaeological sites, with the artistically vital, economically struggling pueblos of San Ildefonso and Santa Clara nearby. I took a walk through the Western Area, and it’s got a variety of housing, most of it modified beyond recognition. Parts of it were burned in the Cerro Grande fire of 2000, which sizzled a good portion of the town and the lab. Obviously aesthetics are not part of scientists’ vocabularies, but there are a few examples of nifty stuff worth looking at. The general house plans for the Western Area were flat-roofed houses, in a mix of duplexes and single family homes. Their distinguishing feature was the flat roof, and for the duplexes, two brick columns along the front that made for a bit of variety. The street plan yells planned development, with curvy streets interspersed with a few dead ends and a park in the center of the development. As I mentioned, it’s hard to find houses that look original, or nearly original. Many have been tastelessly redone, unfortunately. 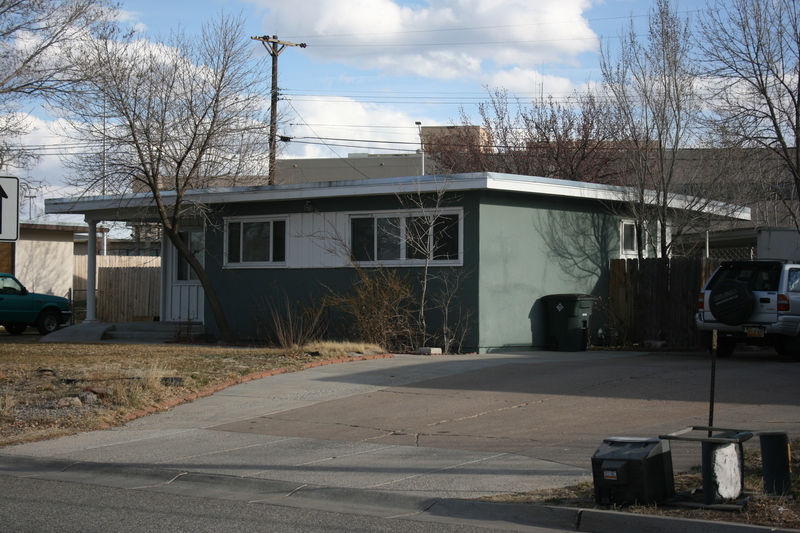 And then there is a well-preserved neighborhood of houses from Denver Steel, modest dwellings made of steel, less than 900 square feet in size. They are plain, simple dwellings, and are located in what I would guess to be the wrong side of the tracks, for Los Alamos, anyways. Despite the rather ragged neighborhood, they seem to have survived without major changes. 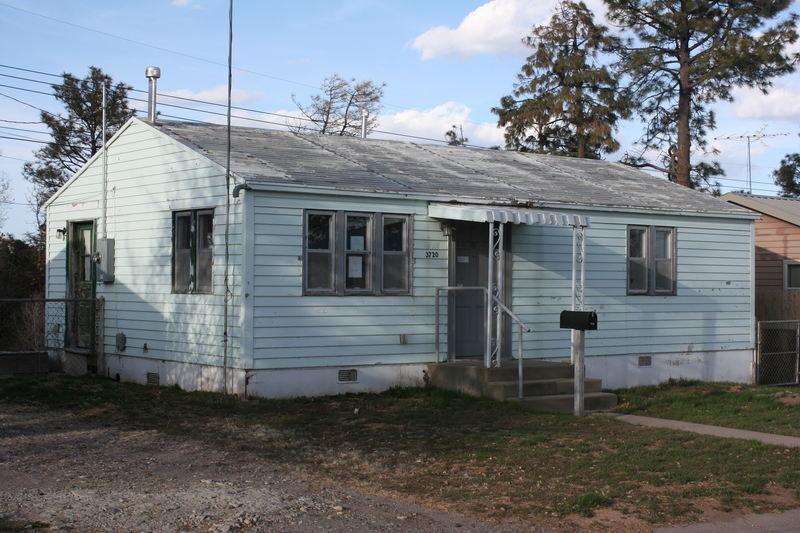 Finally, there’s the Lustron houses, a short-lived prefabricated house built just after World War II. These are rather interesting houses, only about 1500 remain in the U.S., and five of them are in Los Alamos. They came in a rather bland color scheme, with these square porcelain-enameled steel panels, a signature squiggly column near the entrance, and a steel roof that also acted as a heating element. The steel roofs look brand new, 60+ years on, the sides of the buildings are a mixed bag. Chipping of the enamel sped up the rusting process very quickly. The New Mexico ones seem to have avoided the problem due to the very dry climate. And, these are funky houses, steel inside and out, so decorating the walls must have been a task! Cleaning them is theoretically easy, just a hose-down. They deserve to be on the National Register of Historic Places, and have a devoted following for retro aficionados.